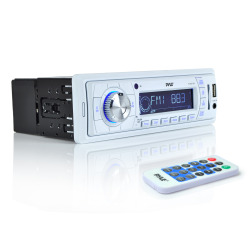 Pyle’s Hydra series has the solution for your marine audio needs – this PLMR19W head unit is capable of tuning AM/FM, weatherband (so you’ll always be prepared), and playing MP3s from your USB stick or SD card. It’s rated at 4 x 50 watts, so each speaker has plenty of independent power. And it comes with everything you’ve come to expect from a modern head unit: a 30 station memory, an auxiliary input to hook up an MP3 player or iPod, and a dot matrix LCD display. The LCD screen is backlit and shows relevant track info. A wireless remote control means you can change tracks without having to get up. Adjust volume, bass, treble, balance, and fader using the built-in controls, all illuminated by cool blue light. Marine coating keeps this head unit ticking through the elements. Pyle’s head units will have your music sounding great at the dock or in the middle of the ocean. Does this Radio come with a AM/FM antenna? If not what would you recommend?